Home › News › How To Do A Quick Ponytail That Stays All Day! How To Do A Quick Ponytail That Stays All Day! Is this your morning routine: You hit snooze too many times, so now you have ten minutes to get ready for the day, not to mention you have major bed head and morning breath? Your routine might be messed up but your hair shouldn't be! It's hard to look forward to the day ahead when you're stressed out thinking about your hair. Wouldn't it be awesome if there was a way to do a quick ponytail that stays all day and looks great? The Pony-O is the one hair accessory on the market that will hold your ponytail comfortably and securely all day. And it's super easy to use! Make Your Ponytail Quick & Look Extra Chic In Seconds. Step 1: Using your thumb and forefinger only, pull your hair through the Pony-O, making sure to keep it close to your head. Step 2: Letting go of your ponytail, flatten and squeeze the Pony-O to hold your hair in place. Step 3: Using your thumbs, individually bend the sides of the Pony-O to secure your ponytail. DO NOT bend your Pony-O ONCE IN THE MIDDLE. TIP: For a more secure hold, bend the ends a little more. If you pull on your ponytail to tighten it, that will open and loosen the Pony-O. Pony-O holds whatever hair type you have, and making a ponytail using Pony-O will definitely speed up your morning routine. Sleep in peace knowing that your hair won’t crease. The Pony-O is crease free and super comfortable! And since it holds the hair securely, you can actually roll out of bed on those crazy mornings with the perfect and hassle-free good to go hairdo. When you use the Pony-O in place of all of the archaic hair accessories in your drawer, you can have a perky and full ponytail that holds all day with zero damage! There's no need to use other hair products like bobby pins and elastics. Pony-O stands alone and holds your hair and stays up throughout the day. It works great with any type of hair: fine, curly, thick, long, or straight hair. The Pony-O is also perfect for children's hair. Since the Pony-O is actually holding your hair, there is no tension on the follicle, and no damage or ponytail crease. Save yourself the hassle of going back going back and forth with your teasing comb and hairspray and further damaging your hair in order to achieve a textured ponytail. 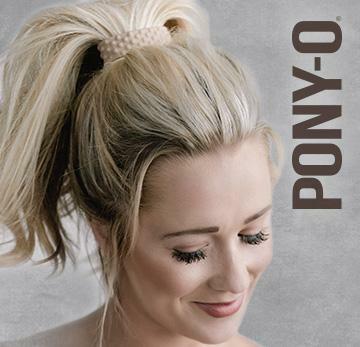 Pony-O's revolutionary and patented design puts an end to saggy and loose ponytails. Why not make the switch and order yours here? Questions or comments? We'd love to hear from you! Needing a little assistance? We offer free FaceTime sessions! Contact us at: support@ponyo.com or call 303-838-6976 to schedule yours!